Yeah, I should’ve saved this for Meatless Monday. BUT, the truth of the matter is I cooked this dish back in January, so it’s waited this long and I decided it couldn’t wait any more. It’s just too tasty and nourishing, and while it was great in January, mushrooms are always in season and greens are great in the spring, too. So, here’s a dish I put together to get some more potassium in my diet in a form other than bananas. Why? My doctor was aghast, because she thought chefs like to eat everything, and what was wrong with a harmless banana, anyway? When I begged her to tell me what other foods had potassium in them, I was happy to hear that leafy greens and oranges all have high amounts of the mineral floating about in their happy little plant cells, just waiting to be metabolized in my body and turned into good stuff. And, even more importantly, greens and mushrooms taste like heaven together. The lightly bittersweet richness of the greens melds perfectly with the earthy fragrance of mushrooms and makes a happy culinary marriage. For a while, I just sauteed onions and garlic in olive oil, then browned some mushrooms in it and tossed in greens and a bit of chicken stock (chicken has potassium, too), and braised it until the greens brightened and wilted a tiny bit. Then, I seasoned with some balsamic vinegar and salt and Aleppo pepper and ate that with whatever dinner was nearly every day. And it was delicious–but you know, after a while, the same basic dish, no matter how loverly gets monotonous after a while. So, I decided to take my combination of mushrooms and greens out of the rut I had driven them in and put them back on the road to culinary joy. I decided to take my saute, and turn it into a tarka, and use it to season masoor dal (red lentils). This would necessitate the addition of some spices–oh darn, you know I hated that–and a substitution of ghee or canola oil for olive oil and lemon juice–if I used it at all–for the vinegar, but who cares? It would still be good. Oh, what’s a tarka? Well, yeah, I wrote a post about that, oh, umpteen years ago and in case you missed it, here it is. But for those who don’t want to read an entire post, a tarka refers to taking ghee or oil and cooking aromatics and spices in it until they are nice and brown and filled with flavor. Then the spiced ghee or oil and the aromatics and spices are all stirred into a curry, dal or other Indian dish to give it a big old whompin’ burst of flavor. And it works like a charm. 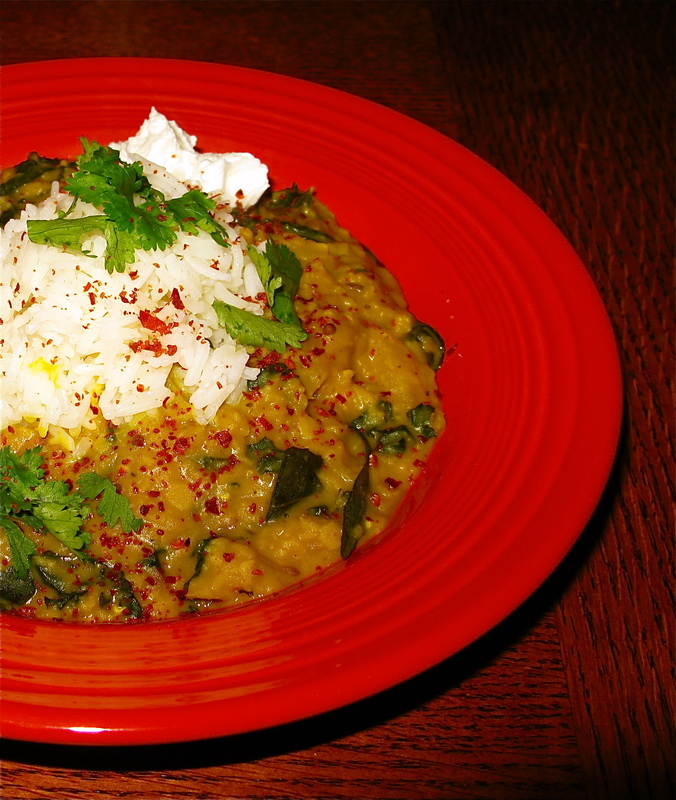 A dal without tarka is a pretty boring lentil dish. A dal with it is like eating lentils with firecrackers exploding with flavor on your tongue. It’s amazing. So, don’t ever let dal leave your kitchen without a tarka. Please. Oh, and by the by, in Southern Indian cookbooks you will see “tempering” referred to–that is just another way to say making a tarka, which is a Northern Indian term. By any name, the technique makes superior dishes, and you should learn how to do it. And I was right. It was good. I cooked up a big old pot of masoor dal only seasoned with a pinch of asafoetida, a teaspoon of powdered turmeric and about two teaspoons of finely grated fresh ginger, and after it had turned into a lovely yellow puree, I was ready with the contents of my saute skillet, which was onions cooked to a deep reddish brown, thin slices of golden garlic, thin, browned slices of fresh chili peppers, browned fresh curry leaves, crisped and golden fresh shiitake mushrooms and button mushrooms, whole cumin and mustard seeds and wilted finely sliced lacinato kale leaves and baby spinach leaves. The sizzling tarka was scraped into the finished dal, and stirred into it with a generous sprinkling of salt. The lid was clapped on the lentils and left for about five minutes so the flavor of the tarka could completely infuse the legumes and voila–it was suddenly ready to be sprinkled with fresh cilantro leaves and served with steamed basmati rice and yogurt or raita. So easy, and so tasty–and even better when heated up the next day. And the next day. And the next one. One big pot of this fed three adults for the first dinner and then made lunch for me for three days running. Not bad for a dish that really only took an hour or so to make. Especially considering it helped me to avoid eating bananas for four more days! Put the picked over and rinsed masoor dal in a deep saucepan and add water to cover by about an inch. Add the asafoetida, turmeric and ginger and over high heat bring to a boil. Turn the heat down and simmer, stirring as needed, and adding water as needed, until the lentils cook down to a thick, yellow puree. Turn off heat, cover and let stand. Heat ghee or oil in a heavy, deep skillet over a medium high fire. Add the onions, sprinkle with salt, and cook, stirring, until the onions are a pale golden color. 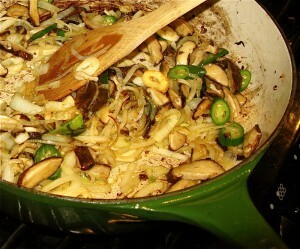 Add the mushrooms, and cook, still stirring, until the onions brown on the edges and the color of the onions deepens to a medium golden color. Add the garlic slices, curry leaves and chili slices, and keep cooking and stirring. Stir, stir, stir, and stir some more. Are you tired of stirring? Too bad, keep stirring. It’s good exercise. When the garlic picks up a very pale golden color and the onions are starting to actually brown and are dark gold, add the mustard and cumin seeds. Cook, stirring (I bet you knew I was going to say that, didn’t you?) until the cumin seeds brown and smell wonderful and the mustard seeds sputter and pop. At this point, the onions should be a nice almost reddish brown, the garlic should be golden brown and everything should smell utterly divine. At that point add in the kale and spinach and red chili flakes, and cook, stirring, just until the leaves wilt. At that point, scrape the whole mess into the dal (remove the lid on the dal pot first) and stir it in (you are almost done with stirring, I promise) really well to combine and then pop the lid right back on the pot, and let it sit for five minutes. Taste, add salt as needed, and serve with rice and yogurt, sprinkled with cilantro leaves and lemon wedges on the side. Note: In the summer, you could add tomatoes at the end of the tarka cooking–right after the greens–because tomatoes are yummy in dal and you guessed it–they have lots of potassium, too. Just sayin’. Fantastic recipe. Thanks! Can’t wait to try this. Do you particularly like the combination of shiitake and button mushrooms, Barbara? I wonder which mushrooms are used in India for such recipes. I hate bananas too! I’ve never liked them, I think it’s the texture because I can eat banana flavored things, just not the actual fruit. This looks wonderful, I’ll definitely give it a try. Just wanted to say thank you for this recipe, it was really tasty! I’m always looking for ways to sneak mushrooms past my mushroom-hating husband & son, and this was perfect (although I used about half the quantity of mushrooms, and chopped them into smaller pieces, to make it less obviously mushroomy) – they didn’t complain, in fact my son didn’t notice the mushrooms at all! I must admit I didn’t follow the recipe exactly, but it was virtually the same – I upped the quantity of cumin seeds & garlic (because I love them) and only added a small pinch of cayenne pepper instead of the tsp of chilli flakes as I was cooking for the kids (I used 1 green chilli also). I didn’t really follow quantities very precisely, to be honest, but it wasn’t far off yours. For the kale I used a mixture of various greens plucked from the brassicas in my garden (including kale) as that was what I had to hand (several triffid-like remains of brussels sprouts & sprouting broccoli have kept us in greens long past the point when most people would have dug them up!). I also added a bit of garam massala at the end, and I didn’t have any coriander leaves so omitted them. We eat quite a lot of dal & other Indian-style foods at home, and this one compares very favourably with any authentic Indian recipe I’ve ever made. For some reason it’s never occurred to me to add kale to my dals, but I definitely will be doing in future! Saskia–greens are great with dals. Do try one of the spicier greens, or several–like mustard and turnip greens–mixed in with channa, for example. Very tasty, and wonderfully nutritious. Hadar–most Indian recipes I have seen that include mushrooms seem to be from Kashmir. So, whatever grows there is probably what is used, but the recipes just call for button mushrooms. Me–I like more assertive flavored mushrooms, so I use shiitake and if I have them, oyster, and then mix those with the button mushrooms. Scienter–it’s the taste, for me. I used to like it just fine, but now–ugh. I think I ate one too many when I was pregnant with Kat and cannot stand them now. Just a quick note to say thank you so much for this! It was delicious, and I have a bunch left over to eat the rest of the week. 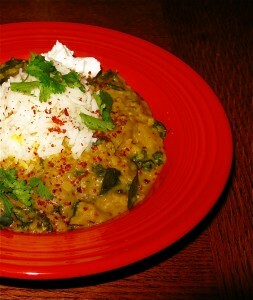 Chana dal with mustard greens–hmmm. That sounds yummy. Chana is my favorite dal, and I only really have one good recipe for it. Would you spice it roughly the same way?